Holy moly, yet another awesome storm for the northern half of Colorado with totals generally between 5-15 inches (details below). For Monday, expect lighter snow showers and a few additional inches of accumulation in the northern mountains, and light snow showers will continue through Tuesday. Thanks to the storm train, our early-season snowpack is well above average. Looking ahead, the next storms on Thursday and Sunday should favor few mountains and instead bring light snow east of the divide. If this were mid-winter, and all mountains were open, there wouldn’t be a thought about what we’d be doing today (Monday). We’d be riding pow in the northern and central mountains! The most snow that fell on Sunday and Sunday night was at Vail where both the mid-mountain snow stake and the Blue Sky snow stake showed 15 inches. Every snow stake cam (and many other useful cams) can be found here on OpenSnow, so no need to go to each mountain's website to view the cams. Below are all of the snow reports from Sunday through Monday morning at 600 am. Since most resorts are closed and not reporting snow, these numbers are based on snow stake cams or backcountry SNOTEL stations with an estimated snow-to-liquid ratio of 15-to-1. We knew going into this storm that it would have the most energy of the past few systems, and it didn’t disappoint. As I went to bed on Sunday night and looked at the cams, most showed intense snow. Those are images that make for sweet dreams! There is a lot of snow. We’re all excited! So where can we take advantage? I’m repeating myself in this section, so if you’ve read it before, please skip! Through Thursday, only Loveland and Arapahoe Basin are open for full-time operations with very limited terrain (2 runs). These are the inbounds spots to get turns. If you head into the backcountry, remember that avalanche risk can exist anytime there is snow on the ground so do not brush this off as early season and lose focus. Also, in the northern mountains, with 1-2 FEET of snow falling in the past few days, along with strong winds, it’s time to put away the “this is just the early season” idea. Check CAIC (Colorado Avalanche Information Center) as they are the best resource for avalanche information and forecasts. Expect a few inches of accumulation through Tuesday night, especially near and north of I-70 and over the higher elevations of the divide. The jet stream will be overhead, which helps to lift the air, and we also have positive vorticity advection (storm energy) which helps to lift the air as well. Further, the newer models are showing slightly more instability, so the air can rise a bit more when given a nudge, especially during the midday and afternoon as the sun heats the earth. Rising air is what creates precipitation. The limiting factor during the next two days will the shallow moisture. 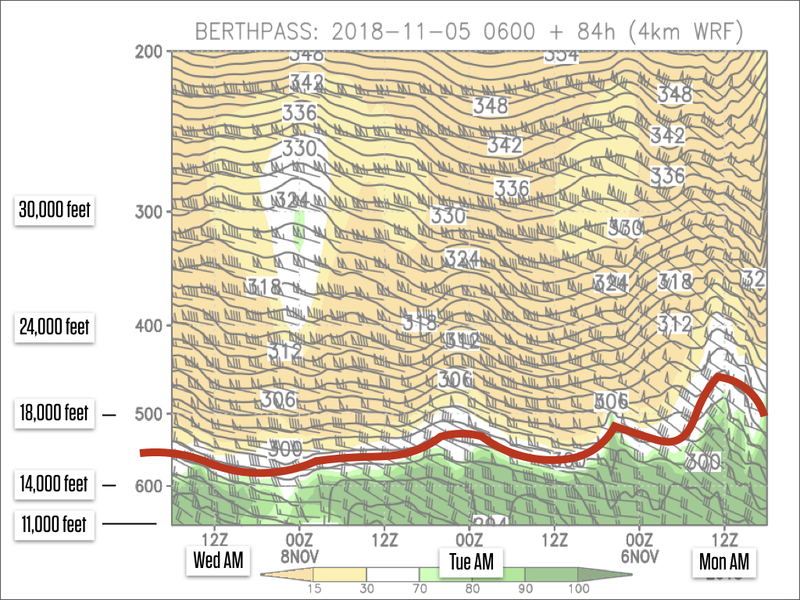 The graphic below is a cross section for Berthoud Pass, near Winter Park and along the northern divide. The bottom of the graphic is the ground, the elevation is listed on the left, and time goes from the right (Monday morning) to left (Wednesday). Green shows more moisture and orange shows little moisture. Notice that the moisture is shallow, only up to ~16,000 feet on average. This is enough moisture to keep clouds around and periods of light snow with a few bursts of intense snow as convective cells move through but is likely too little moisture for additional big totals. This storm still looks like it will NOT bring a lot of snow with most precipitation falling near or east of the divide out on to the plains. The biggest change with this system will be the cold air for all of Colorado on Thursday into Friday morning. We could see another storm similar to the one on November 8th, focusing mostly near and east of the divide. HOWEVER, two models, the Canadian GEM and the Japanese JMA, both show this system coming in stronger and further west, tracking over Colorado. So there is a chance that this could be a more significant storm than most models currently predict. Maybe a storm. This is 10+ days out, so we are grasping at little hints in the models. Thanks for reading and I hope you are enjoying this early season snow! 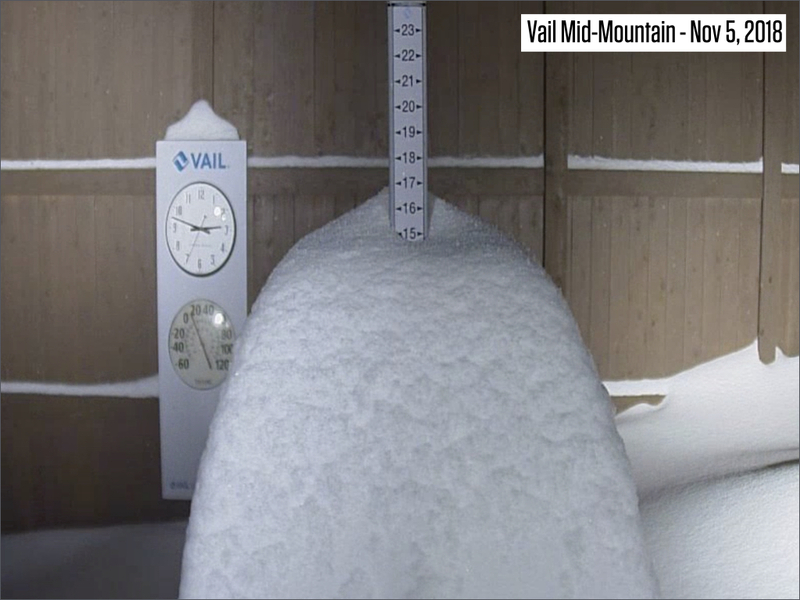 Out of curiosity, I looked at the SNOTEL weather station at mid-mountain on Vail and found that the weight of the snow(snow water equivalent or SWE) on the ground right now on November 5 was about equal to what we had last season at the end of December 2017. We are nicely ahead of last season for nearly the entire state and let’s hope we can keep it that way! My next update will be on Tuesday, November 6. * Friday, November 9 in Breckenridge at the Breckenridge Backstage Theater. Party, my talk, and a movie. Time from 500-830pm. Details here. * November 28 in Vail.